I've been working on a complete redesign of the website, hence the lack of posts. Did you miss me?! Anyway, the new look website is coming along nicely so I thought I'd better spend some time on the dodo before I forgot where I had got too. The picture shows a version of the final line drawing version (no colour) put together on coloured card, I've done the numbering of the parts this afternoon. I'll be adding colour proper to the file next, then print-out, make and photograph. 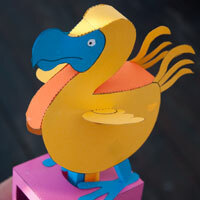 Looks like the dodo isn't going to be extinct for much longer!